The BRG is developing a Neighbourhood Profile through a participative process to enable local residents to create and articulate their own ideas about the Rye Lane West neighbourhood (see map for boundaries), and to make them accessible to others including the Council and developers. To start with, we would like to capture visually through pictures and videos what we like about the area and what we would like to see improved, especially its physical aspects. See here for more details of the project. We are publicising this pictures project in the neighbourhood and are encouraging local residents to contribute by taking photos or very short videos of any parts of the neighbourhood that they especially like or don’t like. Do please let your neighbours know. This picture gallery will create an enjoyable tour round our neighbourhood, and enable us to develop a collective feel for its nature for the Neighbourhood Profile. It is aimed at capturing what people feel who live in the neighbourhood, though we are glad to hear what others think of it as well. So if you post a picture, you will be asked to click the appropriate box to say if you live here, work here, or visit here. If you leave a comment on another picture, please say in your comment if you live here, work here, or are a visitor’. This is much more interesting. With the quasi mansard roofline, projecting parapets and dormers the planners were clearly persuaded it matches its neighbours. Well sort of, but this little development clearly has its own agenda. I like the fact the materials and detail make no effort to reflect the adjacent houses: the second hand stock brickwork, sooted white-washed and all, the simple treatment of the first floor windows, and those crazy steep dormers all work reasonably well creating an interestingly articulated facade. Note the barely perceptible off-street parking . Not that outstanding a development but quite a good try. This is marginally better. At least the windows are more or less correctly proportioned but there is no disguising the fact that it is a different type of building from its Victorian neighbours. The bays are clumsily proportioned, the walls are cavity brickwork and therefore stretcher bonded and of course there are no chimneys. It just doesn't look right. What could be... One (cheap) traffic calming solution would be to allow parking bays on Bellenden road between Chadwick and Choumert road. This disportionately wide section of road allows cars the space to speed. One way of limiting speeding would be to narrow the road by allowing car bays. These need not be ugly as the photos show and could support the local businesses by allowing customers some short-term parking. This could also be done on Bellenden road between Holly grove and Chadwick road; where again the road is very wide for a single lane of traffic. Time was when advertisements like this, on the corner of Chadwick Road and Bellenden Road, were painted all over the gable ends of terrace houses. They are now very rare and fading and so what to do with them? Remove them as eyesores? Unthinkable. Yet to carefully repaint and restore them would be equally crass as it would erase those evocations of the past which we so like about the area. Most of the area has survived reasonably intact since first developed. 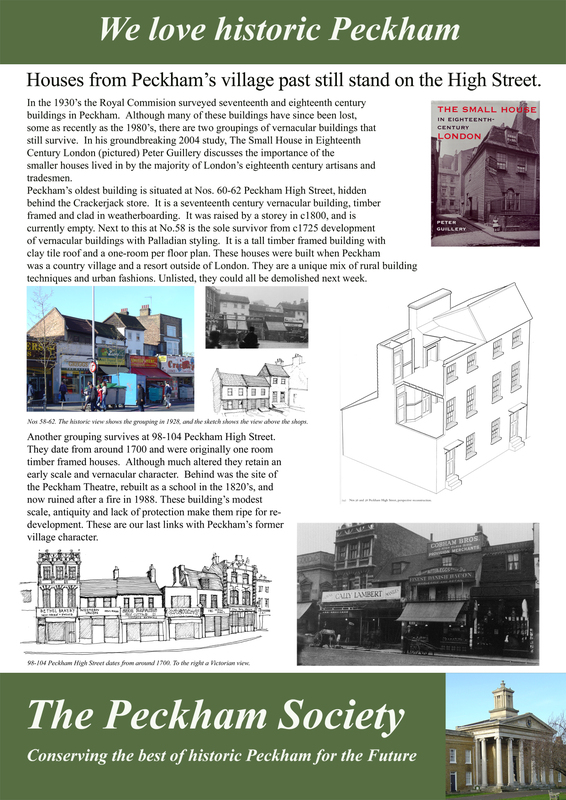 So its interesting to note the occasional odd echoes of changes in Peckham's recent history. Although of no particular interest in itself, this little terrace from the 50s looks like a WWII bomb site infill. On the left, the view of Peckham Academy from Highshore Road. On the right, the view from Bellenden Road. But how academic, and need it look like a concentration camp? Review bookshop on the corner of Choumert Road and Bellenden Road is a focal point for the centre of Bellenden. The number of singers swelled hugely by the time the group made its way along Bellenden Road to my bookshop. An example of how keen local people are to take part in community events. A successful social eating and meeting place created in railway arches and surrounded by industry. Hints at what could be achieved with other imaginative enterprises. The 1940s 'prefab', once so reviled, is in danger of becoming extinct and some are even being preserved. This one, on the corner of Choumert Grove looks well looked after and is a pleasing contrast with the recent development on the far side of Mcdermott Road. If you are going to do it right get it right. That's the message of this one. Not the only approach of course but here the existing terrace has been extended by copying it in every detail. The scale, dimensions and materials all echo the adjoining houses, even down to the stock brickwork with its flemish bond and coloured mortar giving the illusion of weathering. The gates are not to everyone's taste but so what. The only real giveaway are the rooflights. Not applicable in every case but this development works. the tree leaves just coming out and the pink blossom fully out in almost all the streets. This one near the corner with Costa Street and the Montpelier. Choumert Road is the only road that spans the whole width - west to east - of the neighbourhood. From the western top end of the road you can see all the way to Rye Lane and see the buses moving along in the distance. Here the neighbourhood goes gently down from the sedate quiet residential area crossing the Bellenden shopping parade and entering the bustling trading area through Choumert Market into the very different atmosphere of the town centre at Rye Lane. Petitou, on the corner of Reedham Street and Choumert Road, is a delight to the eye as well as for the food. I am retired and have lived in Bellenden Rd for ten years, I am endlessly fascinated by Choumert Sq, having seen it over the years and seasons. Its an Oasis of calm with some really nice residents and many mad Cats. In any season, Choumert Sq is an unfailing antidote to our mad PC ridden world. This house is prominent on the corner of Danby Street and Copleston Road, and is currently (April 2009) being renovated. The developer/owner who is sometimes present during the building works says he is converting the house into apartments but retaining original features. Let us hope this is so as this is an attractive building in a very prominent place. I love the way the Spring pink tree blossom matches the pink pavements (designed by Zandra Rhodes). The cleaned up shop fronts give a good feeling especially in the sunlight. I love the Open Space at Goose Green - the trees, the grass and the feeling of openness. Pink abundance in April in Gowlett Road, and many of the roads in the neighbourhood. It is beautiful till the rains come and wash them off the trees. This ugly site in Highshore Road (near the postal sorting office) has been the scene of a number of aborted developments for around two years. It would be interesting to know what is going on. Meanwhile, waste bins frequently block the pavement. Complaint to Southwark Council (which is hot on cars that do no harm) has been unavailing. Thanks to Southwark Council and especially to all who signed the petition! Following a petition from Keston Road residents and a grant of £50,000 from Rye Lane and Nunhead Community Council, Southwark Council have agreed to resurface our road. We look forward to showing you the results in due course. Our street is full of ornamental fruit trees that would be more at home in a park. I would love them if they were properly maintained; regular pruning etc. They look beautiful for a day until the traffic mangles them due to their size, (see picture) and then when the wind and rain arrive, two tons of wet petals descend on everything, then turn brown and slippery. We have had several replacement trees in recent years- it would have been good to have been consulted on the species planted. This is an old painting of Lyndhurst Square from the mid nineteenth century. The Wildlife Garden is tucked away in the space behind Grove Vale and Ondine Road, where the old Council refuse depot used to be. The entrance is in Marsden Road with lovely gates installed by the Bellenden Renewal Scheme. This picture is of the 2006 BRG Summer Garden Party, an enjoyable day for people of all ages, in such a lovely setting. I love these sheep. They always make me smile. This little garden is lovely. Go and say hello to the sheep. This small green is the northern edge of Peckham Rye Common, just where Nigel Road joins Peckham Rye and Rye Lane. As part of the Common, it has the same protection as the Common from development. Until a year or so ago, there was an ugly broken metal railing around it, and the same kind of railing around the next part of the Common just further south. Then the Council took the railings away and it transformed the look and feel of the whole place, literally over night! It was wonderful. In summer the trees in this part of the Common from here to East Dulwich Road are magnificent, and my most favourite tree place in the area. This is another small terrace of attractive buldings opposite the Nigel Road junction. Just right for the 'facelift' treatment that some Bellenden streets got, but they wait in vain, and this and the other street frontages in this important gateway to the town centre remain so neglected. All-in-all, its worth a nosy perusal at these new nine houses before the build is soon to be completed. And, if you do nose around - the sooner the better - since you will certainly recognise the unmistakeable dark-blue liveried Doran Bros van, maybe, hear an expletive in Irish accent which prevails upon one of Doran's 'European employees' who day after day look tense, hurried, fractious as they point a pier, lay a paving, carry a hod or 'whatever' always overlooked by either Doran brotherhood's beady eye for their 'Patrician perfection'. For two or three years the BRG arranged carol singing by local residents at the station one evening near Christmas. It was really enjoyable to be singing together, and it was wonderful to see rail travellers' weary expressions change to uplifting smiles. Quite a number stopped to join in... It was a great feeling of community spirit all round, in the ticket hall we all know so well from scurrying through to and from trains. Peckham Library at Sunset. A view from the Hannah Barry Exhibition on the top floor of the multi-story car park. It shows how close we are to the centre of London, yet our transport links to it are constantly under threat. As Usual - Are We To Expect Another Dowdy Rye Lane Christmas? Christmas 2008/9 in Rye Lane as with previous year showed Christmas lights dowdily arranged without comprehension to any seasonal aesthetic as to 'a glorious promenade of glittering lights' that might easily be achievable. Just witness the haphazard hanging of lights where many in-between posts are ignored making the overall aspect ‘mean and uneven’. Notwithstanding, that on Christmas Eve 2008 when my photos were taken lights were unlit at 3.42pm just as shops are about to close early on the last Christmas shopping day. “Yes” lights reluctantly brighten 5mins later at 3.47pm as ambient light level triggers auto street lights to turn-on. Seems like Mr. Scrooge is alive and well in his woebegone Southwark Town Hall garret switching off and turning on Peckham’s “Bar Humbug” Christmas lights. I will certainly be out again recording Christmas lights in Peckham 2009. Will Southwark’s Ebenezer still have his finger on the switch again one wonders? Rye Lane on an average weekday. Some familiar sites for those of us who don't drive everywhere in a people carrier, can't afford organic food and don't employ an Eastern European Nanny to look after our kids which, incidently. all have triple barelled names like Oliver-Dolphin-Evelyen James Joyce Harry. Rye Passage as it was after first temporary improvement in early 2008, paid for by CGS funds. Work now stalled, waiting impatiently for completion with new and realigned fencing to open up the passage and to remove blind spots. Peckham Rye Passage is a lovely lane just off Peckham Rye leading to Nutbrook Street. It is ruined by broken down fencing which encourages rubbish dumping and urinating at the Peckham Rye end. This is how it was recently after the first clear up. McDermott Road is a long road coming from Maxted Road. In the distance the eye is caught by a small group of white buildings. I like that view. This terrace was built in the1980/90s to replace several pre-fabs built on war damaged land. The roof line sticks out like a sore thumb and doesn't fit with the older one, and the proportions of the newer terrace are dismal compared with the old ones. Friends of Warwick Gardens host an annual Dog Show and Fete which is great fun and involves all the local community.